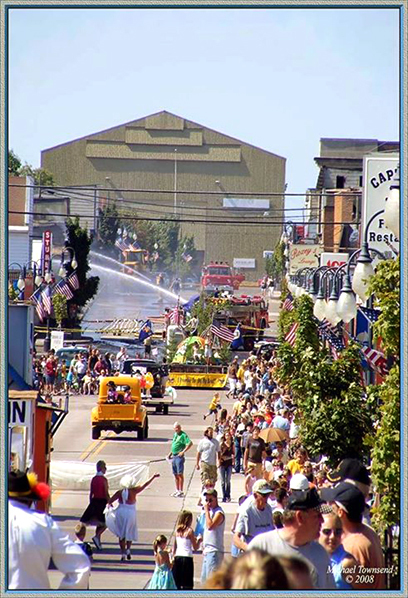 Photo provided by Jan Tucker A fire in downtown Ontonagon during the 2008 Labor Day festival did not halt the parade. ONTONAGON — The Labor Day festival has been held here for 62 years and is an important part of the community, because while it is full of tradition, it also features new ideas. The 2018 events run from Friday through Sunday and include parades, an auto show, street vendors, rock skipping championships, a community picnic and music. The core of the festival has long been the parade and the custom-made floats, known for their elaborate design, said longtime Labor Day Committee member Jan Tucker. “They begin working months and months before the parade… We don’t have a theme, because they dream up their own,” she said. In a community of builders, the elaborate floats and costumes are a serious matter and can only be judged by those who live out of the area following a previous winner controversy. “People were in the business places yelling at the people … They were the judges, and they said, ‘No more,'” Tucker said. Now selecting the winner is up to out-of-area guests in town for reunions. Despite the tried-and-true staples, new activities are always fair game with mixed results over the years. New this year is a street dance and bed races. “If it doesn’t work, that’s OK. We’ll try something new next year,” Tucker explained. One memorable idea involved three parachuters landing in town to start off the parade. It now remains one of the ideas firmly on the Do Not Try Again list. “Down came the parachutists, and we say, ‘Here they come,’ and all of a sudden one of them hit a power line. The power went out. The guy plunges to the ground. People are racing down there. I’m yelling, ‘Stay away, stay away, we’ve got a downed power line,'” Tucker said. The man escaped with a burn to the thigh, and the other two parachuters overshot the town entirely. So the idea of parachuters was banned. The festival brings people from around the region, and many return to the area for reunions. “It’s an ideal time for reunion, and they always make it during Labor Day because Labor Day was the highlight when they were young in Ontonagon,” Tucker said. The Labor Day festival remains one of the area highlights each year.